From the lead prosecutor on the Enron investigation, an eye-opening examination of the explosion of American white-collar crime. If "corporations are people, too", why isn't anyone in jail? A serious defect in a GM car causes accidents; Enron scams investors out of their money; banks bet on the housing market crash and win. In the race to maximize profits, corporations can behave in ways that are morally outrageous but technically legal. 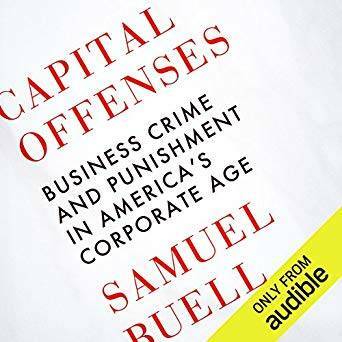 In Capital Offenses, Samuel Buell draws on the unique pairing of his expertise as a Duke University law professor and his personal experience leading the investigation into Enron - the biggest white-collar crime case in US history - to present an in-depth examination of business crime today. At the heart of it sits the limited liability corporation, simultaneously the bedrock of American prosperity and the reason that white-collar crime is difficult to prosecute - a brilliant legal innovation that, in its modern form, can seem impossible to regulate or even manage. By shielding employees from legal responsibility, the corporation encourages the risk taking that drives economic growth. But its special legal status and its ever-expanding scale place daunting barriers in the way of federal and local investigators. Detailing the complex legal frameworks that govern both corporations and the people who carry out their missions, Buell shows that deciphering business crime is rarely black or white. In lucid, thought-provoking prose, he illuminates the depths of the legal issues at stake - delving into fraudulent practices like Ponzi schemes, bad accounting, insider trading, and the art of "loopholing" - showing how every major case and each problem of law further exposes the ambivalence and instability at the core of America's relationship with its corporations. An expert in criminal law, Buell masterfully examines the limits of too permissive or overzealous prosecution of business crimes. Capital Offenses invites us to take a fresh look at our legal framework and learn how it can be used to effectively discipline corporations for wrongdoing, without dismantling the corporations.